Isao Takahata might not be quite as famous as Hayao Miyazaki (The Wind Rises) is when it comes to Japanese animation, but Miyazaki’s co-founder of Studio Ghibli warrants just as much esteem from North American audiences as his retired colleague does. Takahata’s latest film The Tales of Princess Kaguya is one of the finest films that Studio Ghibli has ever made. Hand-drawn films like Kaguya are a rarity these days in the growing sea of computer-generated animation, and the classical, painterly details that bring the film to life are the strokes of a true master. The Tale of Princess Kaguya doesn’t have the same vibrant palette as some of the Miyazaki-directed Ghibli films do, nor the same flight of childish whimsy, but this beautiful film is deeply rooted in myth and folklore. The comparatively sober palette of Princess Kaguya is both earthly and ethereal, and the exquisitely detailed images of the film are like striking watercolor paintings with each frame of the film evoking a sense of wonder with the fluid richness of their imagery. The elegant score by Joe Hisaishi is likewise playful and enchanting, taking cues from tradition but also having fun with elements of make believe. From the tenth-century fable on which it is based to the mythical imagery that infuses the film, The Tale of Princess Kaguya is very much an animated film for children and adults alike. The film is based on the tenth-century Japanese folktale “The Tale of the Bamboo Cutter,” but Takahata paints Princess Kaguya with a decidedly contemporary sensibility as it tells of a poor bamboo farmer (voiced by Takeo Chii) who discovers an infant one day within a stalk of bamboo. The child grows and the bamboo cutter’s fortune prospers at an equally rapid rate, and soon the girl of modest and mythical origins becomes the most coveted virgin in the land. The film’s second act chronicles the humorous consequences of putting words into action when Princess Kaguya (a spirited Aki Asakura), thwarting the lessons of her father and teacher to be modest and submissive, challenges her five suitors to attain the very treasures to which they compare her. Takahata envisions Princess Kaguya’s strength with a whirlwind of storybook impressions as the Princess flees from the walls that hold her within the palace and thrashes at fields. Her male suitors are similarly confronted with increasingly mythical images—dragons and demonic storm clouds—as they meet fates that are alternately grisly and absurd. Princess Kaguya turns the empty rhetoric of the male courters back on them and responds with vivid images of their words brought to life. The expression of Princess Kaguya’s agency and anger is the film’s most singularly powerful feat of animation, for each image of her growth—both physical and spiritual—has an intrinsically mythological depth and power. The masterful strokes of Takahata's animation convey intense emotions while also using the simple elements of motion within the brushstrokes to grant Princess Kaguya an otherwordly power. By rooting this age-old tale of a spunky female heroine within a classically composed adaptation, Takahata paints a tale of for generations of women who have been defined and suffocated by patriarchal tradition. The film builds an increasing landscape of magical realism as Princess Kaguya creates a world into which she may escape tradition and carry on her strength for generations to come. 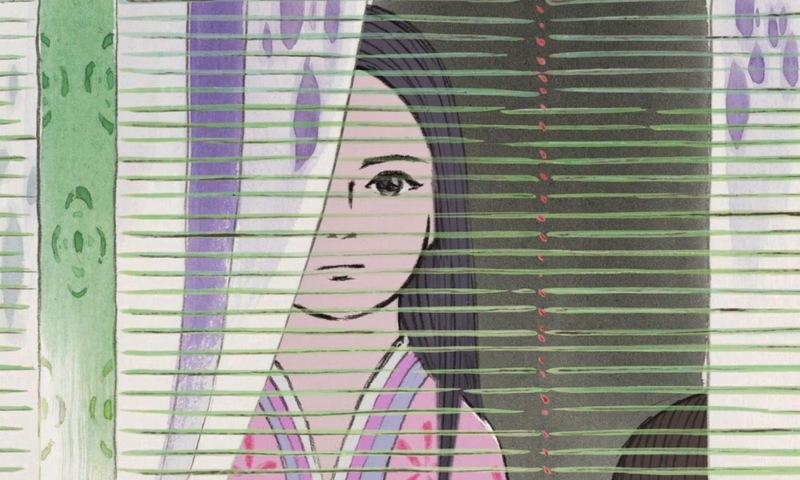 The Tale of Princess Kaguya is not a fairy tale of happily-ever-after with a charming prince and a marriage; rather, it finds happiness in the young girl’s independence and autonomy. The Tale of Princess Kaguya is now in limited release from GKIDS.